The mother of a 17-year-old Christian beaten to death in his classroom, on his second day in high school, has told the police that her son was “hated because of his religion”. Sharoon Masih was on only his second day at MC Model High School in Vehari, Punjab when it is alleged that classmate Raza Ahmed attacked and killed him, on 30 August. Pakistani media reports allege the behaviour (and possible negligence) of school staff contributed to Masih’s death. His mother said Ahmed had stopped her son from drinking water two days before his murder. (The Christian Asia Bibi still remains on death row for blasphemy eight years after she was first arrested, after she offered a cup of water to fellow workers in a field on a hot day: two Muslims refused to take the cup as, they said, she had made it ‘unclean’, simply through her religion and caste). Deputy Superintendent of Police Javed Tahir Majeed, one of three senior police investigating Sharoon’s murder, told World Watch Monitor: “Sharoon’s classmate, Sabir Ali, from his village, Chak 461, told us that Sharoon was sitting at the back of the classroom. When he got up to walk through the benches, Raza sprawled his legs out to block his way, telling him he could not go out. When Sharoon tried to get past Raza’s legs, Raza started to beat him up. Sabir tried to intervene but Raza beat him up as well. Sub-Inspector Muhammad Kashif told World Watch Monitor that it was during ‘Islamic studies’ that class teacher Nazeer Ahmed had gone out of the class. “The teacher has informed us that he had taught four periods consecutively, so he was exhausted and went to the washroom,” he said. Masih had just started at the High School in Burewala city, after completing lower education in his village. District Police Officer Umar Saeed Malik, who visited the family, told World Watch Monitor that as it was only Masih’s second day, it was less likely that there was any issue of a Muslim-Christian conversation but that investigations continue. “Ahmed alleges that on his first day, Sharoon had broken the screen of a mobile telephone that Ahmed had brought to school. However, our investigation proves the screen was already broken; probably Raza was pressuring Sharoon to extract money by bullying him,” said Malik. Sharoon Masih’s father, Ilyasab, told World Watch Monitor that on his son’s first day, the teacher wouldn’t let his son attend as he wasn’t wearing the right school uniform and even slapped him in front of the class. However, the autopsy notes that “no sign of any physical trauma was seen on the body”. District Police Officer Malik said that parts of the internal organs had been sent for chemical examination, and the final cause could only be ascertained after a chemical report. Ilyasab Masih said he doesn’t know whether there were marks of violence on his son’s body. Superintendent of Police Zubaida Perveen and Deputy Superintendent Sajjad Muhammad Khan, with Deputy Superintendent Majeed, form a special team which is to report daily to the Regional and District Police Offices. The justice system is painfully slow in Pakistan and is too expensive for the poor, especially Christians who often neither have money nor connections within the state machinery. Ilyasab Masih hopes to get justice. “I have complete faith in Jesus that we will get it,” he said. Masih’s killing has heightened fear among Pakistani Christians. Sub-inspector Kashif said there are at least 24 Christian students in the school; Deputy Superintendent Majeed said school staff told his team there are 47. One staff member is also a Christian. The Vehari District is not so far known for religious extremism, but this is the latest in a recent series of incidents in Pakistan. Three weeks before, a 16-year-old illiterate Christian boy was forced to confess to blasphemy to escape mob violence in Gujranwala, 350km north-east of Vehari. In July, a 16-year-old Christian hospital cleaner near Gujrat, just north of Gujranwala, was charged with blasphemy after getting into conversation with colleagues. 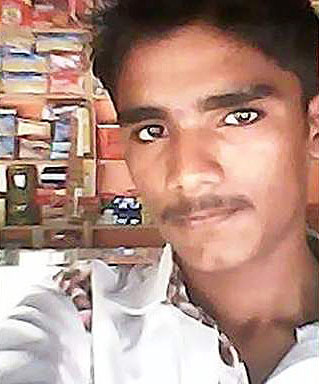 In June, a Christian sewerage worker in Sindh Province died after three doctors refused to touch him during Ramadan, because they saw him as ‘unclean’. In April, a Muslim student was lynched by a mob at a university in the northern city of Mardan for “sharing blasphemous content on Facebook”, an allegation that later proved wrong. Open Doors’ 2017 World Watch List – of the 50 countries in which it is most difficult to be a Christian – places Pakistan at number 4. The 2011 Pew Research Centre’s ‘Rising Restrictions on Religion’ report characterises Pakistan as the third least tolerant country to religious diversity, while another Pew report, ‘Common Concerns About Islamic Extremism: Muslim-Western Tensions Persist’, says that only 16 per cent of Muslims in Pakistan hold a positive opinion of Christians.